Allows for easy comparison of measures by attribute values. Creates a series of charts based on a provided attribute. 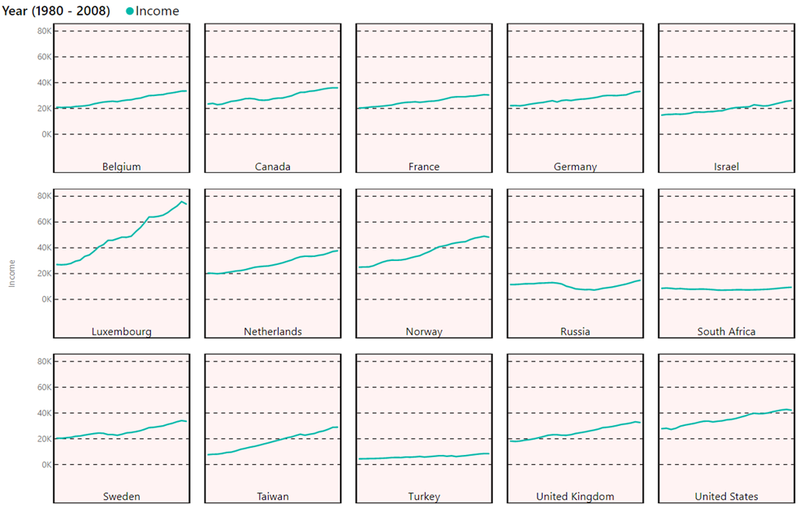 This Small Multiple Line Chart shows countries and their average income per person. Using the Small Multiples section you can adjust how many charts are shown per row and the formatting of the chart labels. Changing the Data Colors section allows you adjust the color of each measure on your line chart. Using the X-Axis section is turned off by default but allows you to show labels on the X-Axis of each column of charts. Using the Y-Axis section allows you to show labels on the Y-Axis of each column of charts. Under the Legend section the position and formatting of the legend can be changed.